You can stop sweltering in a hot house even if utility bills are high. HEAT program helps qualifying Washington County residents. ST. GEORGE – Making ends meet makes for tough choices for some whose incomes barely suffice to cover basic needs for food, water, clothing, maybe even needed medication, let alone covering the utility costs of running their air conditioning during the summer months in Washington County. Yet funds are available to help some residents with those utility bills through a program administered by the Five County Association of Governments. All people need do is apply and qualify. “It’s one of the most underutilized programs we have in Washington County,” Five County AOG’s Clint Cottam said. The Home Energy Assistance Target program, or Heat Program, offers federal assistance money to qualifying households toward their utility bills – gas, electric, even propane, wood and oil. While the program is available statewide November-April, the program season for Washington County continues through September. Residents of Washington County may still apply for Heat money for the program’s 2016-17 season year provided they do so by Sept. 30. It is recommended applications be made by Sept. 15 to ensure time to provide any additional requested documentation for consideration. Residents can then apply for the 2017-18 season, which runs from November 2017-September 2018, beginning Nov. 1. The allotment per household varies depending upon each applicant’s particulars, but typically it calculates out at about $400 for the program’s season-year. The resident may direct that allotment toward any or all of their household utilities as they wish, Kolthoff said, all to one utility or split up between several utilities. There is also money available to help those in crisis. For those facing an imminent shut-off of utilities (usually through a 48-hour shut-off notice hanging on their door), there is crisis money available – up to $500 for each of any two utilities to be shut off. 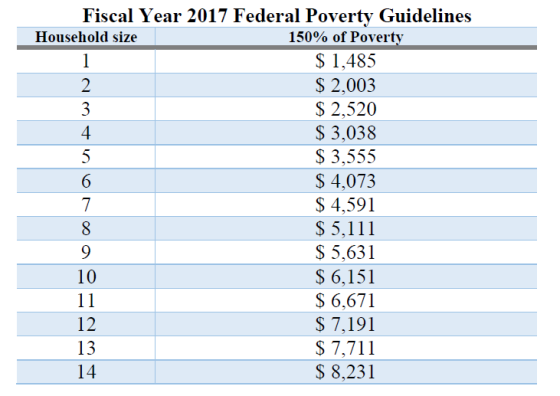 Their total household income is at or below 150 percent of the federal poverty guidelines (see chart inset with this report). Their household is vulnerable; that is, they are responsible directly or indirectly to pay their home energy costs; this would include those who rent or lease and their landlord uses part of their rent to cover utility costs. At least one person in the household is a U.S. citizen or a qualified alien with acceptable immigration documents; this means the household qualifies even if the only person that meets this criterion is a child. The program is especially targeted to help the elderly, 60 and older; households with children ages 6 and younger; and the disabled. Households with a person meeting any one of these target definitions may receive an additional $150 toward their utility costs. The number of households applying for the assistance funds has gone down over the past three-four years, Kolthoff said. In the program’s 2016 fiscal year, 1,978 households were served in Washington County whereas this year only 1,835 have participated so far. Sometimes other fears keep people from asking for help, but Kolthoff stressed that program workers are there to help – not judge – a person or their household. In other cases, people may hesitate to apply because they are concerned about the condition of their home. Some people that have been helped are homebound. Another woman the program helped had terminal cancer. She had young kids and a $1,200 utility bill, Kolthoff said. The best thing to do, Kolthoff said, is call for an appointment. Program administrators will work through the process with applicants but they do not accept walk-in appointments. In Washington County, call 435-652-9643 to get started. Download an application to complete and mail or submit online. Applicants must provide certain documentation, including ID, social security cards for everyone in the household, proof of citizenship or other qualified documentation for every member of the household born outside the U.S., copies of most recent utility bills, proof of income, proof of qualified medical expenses, proof of child support and/or alimony paid or received in the month prior to the applicant’s appointment, proof of disability where applicable and proof of a child in the home under age 6 (birth or blessing certificates are acceptable). More particulars about the application process can be found online at the Five County AOG’s Heat program webpage linked here. The Heat program is again available to residents of Washington and other counties in Utah beginning Nov. 1. Garfield, Iron and Kane counties, for example, also saw decline in participants during the 2017 seasonal year, while Beaver County saw an increase. Contact numbers for appointments by county can be found online.